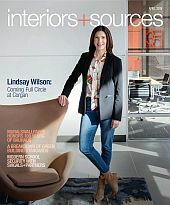 Welcome to the interiors + sources reader service Web site. Use these pages to quickly find and request free information on the products and/or services found in the pages of interiors + sources. You can ask companies to provide you with more information or link directly to their web site. Crossville Inc DESIGN A SPACE THAT TAKES YOU PLACES. Roppe Corporation USA MAKE SURE YOUR FLOORING PASSES ALL THE TESTS. International Interior Design Association IIDA MAKE SMART CHOICES ABOUT YOUR DESIGN CAREER.